Wildland firefighting, a high-demand field that aligns closely with existing Paul Smith’s College academic programs, will now be a minor available to students. Included in the minor is an Incident Qualification Card, commonly known as a red card and a key certification for those pursuing work in the field. Educational background also plays a substantial role — the college’s four-year programs in Forestry, Natural Resources and Conservation Management, Parks and Recreation Management, and Fisheries and Wildlife Sciences are among those preferred by local, state, and federal agencies. Coursework specific to the minor includes tree felling and chainsaw techniques. The curriculum is being delivered in partnership with the New York State Department of Environmental Conservation, whose experts contributed to course design and will teach classes that lead to the red card certification. One of those instructors is Scott Sabo, a 2009 Paul Smith’s graduate, current forest ranger, and someone who has also worked fighting wildland fires in the west. As outlined by Sabo, the program is structured to go beyond the necessary hard skills and include the ecological and technological underpinnings to enter wildland firefighting careers. 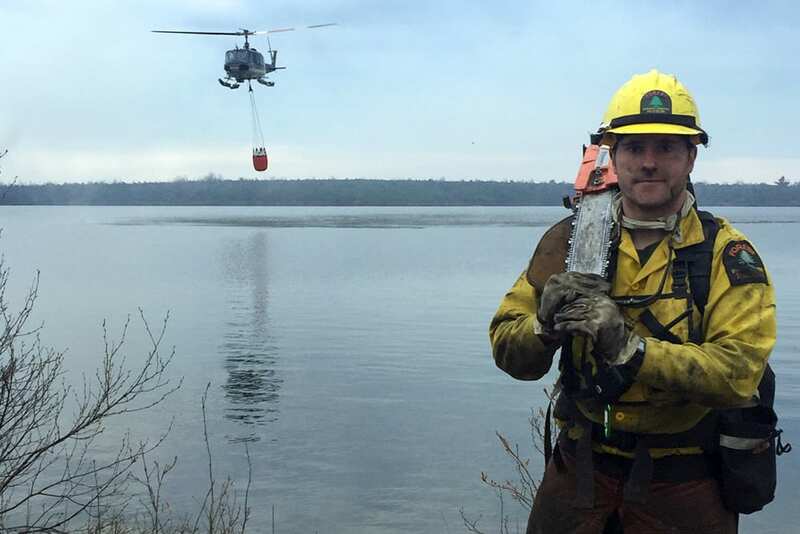 Entry-level firefighters earn approximately $40,000 over the course of a six-month season, making the profession especially attractive to new graduates. Over $1 billion is spent annually to combat wildfires and employment has jumped over 10 percent in just over a decade. Paul Smith’s, meanwhile, has trained wildland firefighters since the late 1940s and has seen a number of alumni join the ranks since. Pictured above: Firefighters work to contain a 2016 blaze at Sams Point in Ulster County, N.Y. The fire consumed more than 2,000 acres over several days. Photo courtesy of Scott Sabo.